Here’s Scott Speed in a purple sparkly unitard anyway. 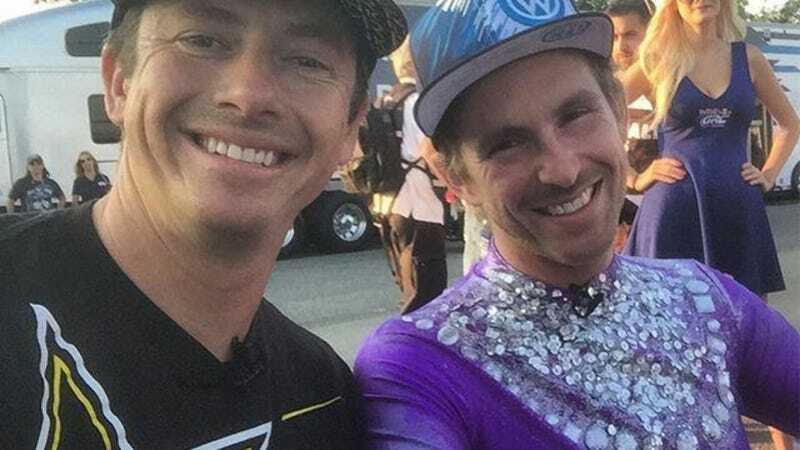 Speed apparently lost a bet to fellow Global Rallycross competitor Tanner Foust, who then requested the he dress up like a character from figure skating farce Blades of Glory. Here’s a better look, courtesy of Foust’s Twitter account. You’re welcome. Racing may be more associated with Talladega Nights, but you know what? When purple spandex is involved, I’ll make an exception. In fact, drivers should sign autographs in silly outfits all the time. We know what you look like in a racing suit. We don’t get too many opportunities to see you in rhinestones and sequins. Whoever invents fireproof, FIA-rated sequins and/or rhinestones will be a hero to all.